In the past, I’ve used Yaktrax or another traction device that you strap onto the outside of your shoes to run safely in the snow and ice. Some of the feedback I’ve gotten from the review and asking around is that putting screws into the soles of an old pair is a way to make sure you don’t slip, without having to muck around with an extra piece of equipment, and it’s cheap too. I filed this away somewhere in my brain for at least a year before Jessica from Laces and Lattes reminded me of it and provided this link with instructions for the best implementation (via Skyrunner). 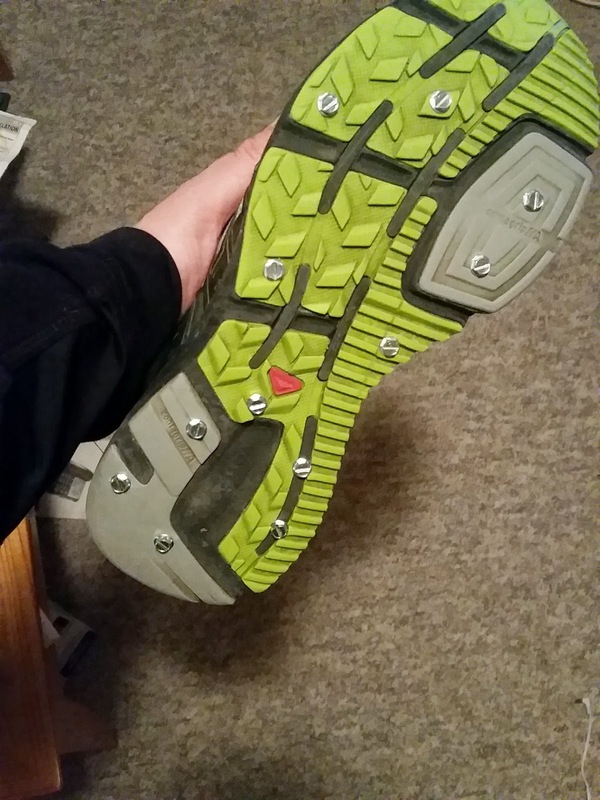 Skyrunner prescribes hexagonal sheet metal screws, and says 3/8" isn't too long for most shoes. I wasn't able to find 1/2" screws, so I figured I would have to gamble. I'd be putting them into my old Salomon's which have served me well, and don't owe me anything. Being a trail running shoe, they're already well suited to more extreme conditions and they're probably the best shoe I own for running in the snow, regardless of what kind of traction assistance I'm getting (if any). Still, the notion of these screws being in my shoes with the sharp ends pointing up made me nervous; one of the challenges I've found about winter running isn't the snow or ice, per se, it's the mixture of plowed sidewalk (running on cement) to sudden transition of ice and/or snow. With the Yaktrax I found running on the plowed sidewalk to be like getting light acupuncture... I was worried it wouldn't be so "light" with the screws! I'm glad I had a drill with the right attachments; I wasn't afraid of using some muscle/elbow grease to get the screws in, but the rubber makes it hard to get a hole started. While the instructions mentioned having screws numbering upwards of 18, but that seemed like overkill. I put 12 into each shoe, and I managed to be almost symmetrical on each shoe, but not quite. On Thursday, I took them out for a run. Or more accurately a "Runch" - when you run on your lunch break. Challenge #1: not wearing shoes with hard metal protrusions on the soles on any delicate surfaces like the change room floor (this goes double for my floors at home) on the way out. I waited till I was on a rug by the exit before I put the shoes on. The first surface I ran/walked on was the plowed walkway near the office. To my surprise, the acupuncture feeling was less with the screws than I remember it being with the Yaktrax. I did notice when I progressed onto the sidewalk on my way to enter the Etobicoke Creek Trail that I was getting some poking on the side of my foot, right in the space between my big toe and the ball of my foot. Not stabby pain, but not comfortable either. 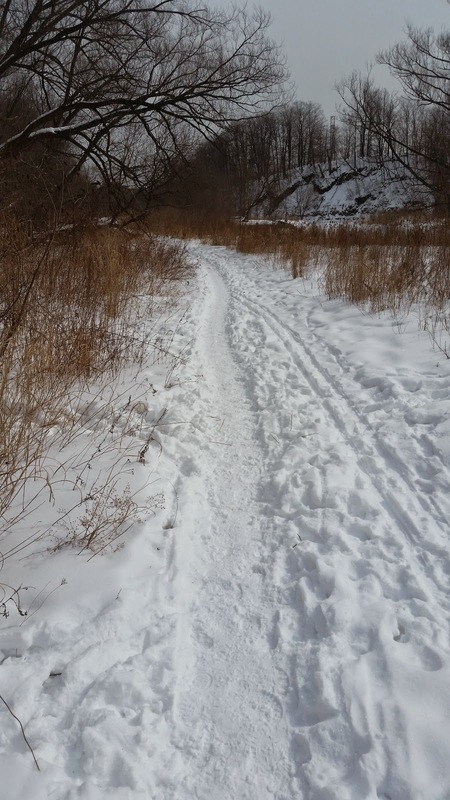 Once I was on the snowy trail, the discomfort went away entirely. I couldn't feel the screws at all. That's both the good news and the bad news. I started off slower, with the intention of really making sure I warmed up properly and slowly in addition to wanting a negative split on the run. On the way back, if I pushed the pace a little, my feet slipped backwards on each step. If the snow had been packed down unevenly, my feet could slide laterally to the edges of the cleared/tramped down space of the path. I made the final climb off the trail back out to the road without any extra traction at all. It wasn't totally slippery, but on the other hand, the Salomons have a good enough tread that I don't think I would have slipped any more than I did had I not installed the screws in the first place. I can practically hear proponents of this method now: I didn't put enough screws in, or by placing some of them in between treads, I minimized their impact. That may be true, but given that at least one screw was hurting my foot, I think I was right not to put too many in, and many of the screws were placed on the flatter areas of the sole, and did not provide any perceived improvement. 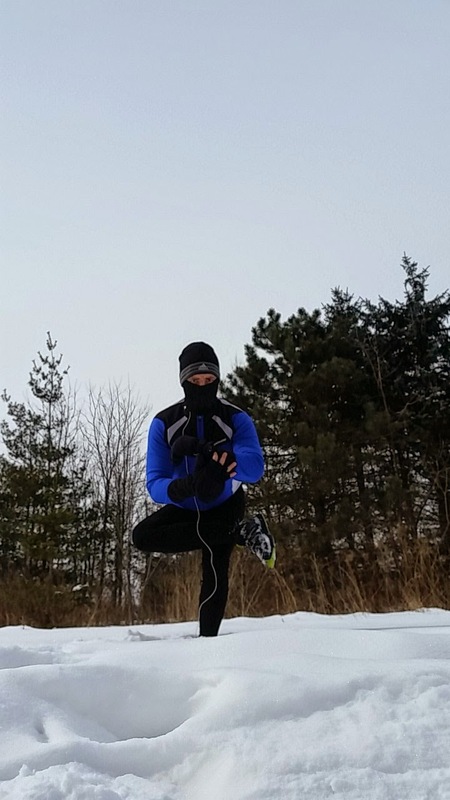 Do you run in the snow with a little extra traction help? If so, what kind?